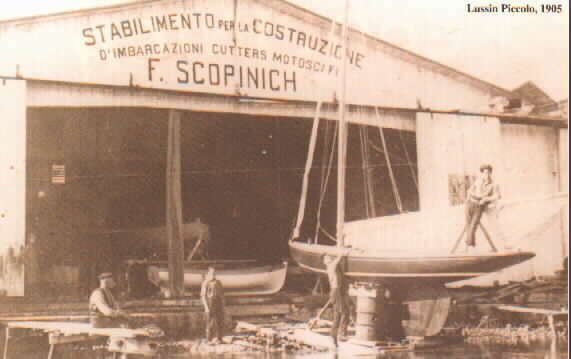 For more than a century the name "Scopinich" has been synonymous within the yachting community with craftsmanship, service, reliability and integrity. When we place the name "Scopinich" on our fighting chairs, it represents the pride and reputation on six generations of master shipbuilders. This famous name can be traced to a small island off the eastern shore of the Adriatic, Lussin Piccolo, where, from the mid-nineteenth century great grandfather Scopinich owned and operated the Scopinich Boat Works. In the early twentieth century great uncle Mirto Scopinich and grandfather Federico Scopinich migrated to the U.S. and kept this heritage of excellence flourishing at their two locations in Freeport, Long Island. Despite the Depression, hard work, dedication and skills learned in the old country gave Scopinich a reputation as the builder of the finest boats coming out of Long Island’s many shipyards. In 1942 the two Scopinich yards were awarded the coveted U.S. Army and Navy "E" prize for excellence in war production. Federico’s son, Mario, carried on this tradition of excellence at the Hampton Boat Works at Hampton Bays, Long Island. Today, Paul Scopinich, Mario’s eldest son, continues the family tradition by building the finest marine products in the world. A Scopinich product is a statement of excellence, a handcrafted masterpiece using only the finest materials. Its innovative design, superior ergonomics, sophisticated engineering and perfectly machined metal components, combined with the finest finish, make a Scopinich the barometer of excellence against which all others are judged. Scopinich Fighting Chairs is proud to present it’s complete line of world class fighting chairs, accessories and a range of sport-fishing equipment that assures years of recreational and tournament satisfaction.